Hey kids! I have created series of anti bullying videos just for you. All of the videos will show you the different ways of avoiding common attacks from bullies. Be on the lookout for several more on this blog. In the first video we are going to show you some fancy footwork to avoid the bully’s attack. We call it the “shuffle”. By shuffling, or side-stepping, you are able to easily move out of the way of an attacker’s punches and kicks. Hope you enjoy the video. Please rate it on YouTube or make a comment if you like it. Note: Because anti bullying includes a much wider subject area than we will focus on here, it is now called the Kids Defence Series. I am pleased to announce I have been selected to write a guest post for SuperParents.com.au. This Australian website is a superb resource for anything relating to parenting, including child safety, pregnancy, health, lifestyle, discipline, and much more. Colin Woo, the owner of SuperParents, is also a 5th Degree Black belt in Tae Kwon Do. Colin has asked me to write a post on the subject of how to support your children in martial arts. I told Colin I would be glad to write the article. The article, “How to Help Your Child Succeed in the Martial Arts (or any other sport)” will be published on SuperParents.com.au later this week. Please be on the lookout for it. It will be unique in that the viewpoint will be from that of a child. I am very flattered that Colin picked me to write this article, and honoured to have it appear on a website of this reputation. Please have a look at the article at http://www.superparents.com.au/blog/2010/05/a-childs-perspective/ and check out the website and blog. You can reach black belt if you follow my secrets, work hard, and don't give up. 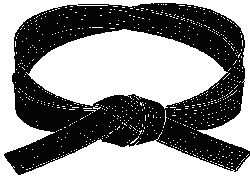 During the last fifteen years of teaching karate for kids I have watched many obtain their black belts. I have also sadly watched many give up. It is especially heart-breaking to see them quit when they are close to obtaining black belt level. Why do some make it and some drop out? I strongly believe if you follow the following steps, you will have what it takes to pass the ultimate test–the black belt. 1. Give the Sensei your full attention. Look and listen when he or she is talking. You will learn a lot more. If someone is talking to you while the Sensei is explaining something, ignore them. 2. Focus your energy and thoughts on what you are doing–never mind what else is happening in the class. Visualize how each move would work against an attacker. 3. Stances are the key to success in all martial arts. Perfect the horse, cat, bow, sparring, or whatever stance your style teaches and you will be on your way to black belt. 4. Realize it takes many years of training to perfect your moves. Be patient with yourself, relax, and enjoy the process of learning and mastering the art. 5. Ignore anyone who says “You are not good at Karate/Kung Fu, etc.”. It does not matter what they think. You will be excellent in the martial arts if you put forth your best efforts. 6. Do not compare yourself to others in the class. Many of us are not gifted athletes, but we can be our best with practice. Your goal is self-improvement, and this will happen with time and effort. 7. Practice all your moves outside of class at least once a week. You will be amazed at the difference this makes and the Sensei will notice. 8. Try to keep yourself fit and flexible. Build up your heart and lungs. Running, swimming, bicycling, or any other activity that gets your heart pumping are the best. Do your stretches regularly so your kicks and punches have greater reach and you have less chance of injury. 9. Be dedicated to your training. There will be times when you don’t feel like going to martial arts class due to the weather or lack of energy. Go anyway and you will be glad you did. It will build your self-disclipine and you will feel great once you get there and start doing it. 10. 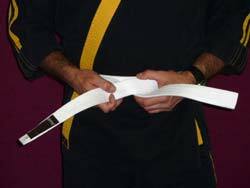 Do not focus too much on the belts–they are not as important as the lessons you learn on your martial arts journey. At least once a month someone tells me they are moving out of town and asks for a recommendation for kids martial arts in that area. I am usually at a loss to recommend anyone because I don’t network much outside of my base in Sydney, Australia. Although sad to see them go, I am happy give them a bit of information that I have acquired over the years to guide them in their search. There are lots of things to look for in a martial arts school, but I feel these are the most important. Determine why you want your child to take part in martial arts. Is it fitness, confidence, self-esteem, discipline, or competition? Different things will be emphasized at each school. Why does your child want to take part? This is the most important question, because many children drop out if their needs are not met. Children might want to start just to have fun and make friends–that’s ok. If a school does not allow you to observe at least a few of their classes before you enroll, walk away. Most likely they have something to hide. Talk to other parents at each school about their experiences. Discipline in the class is important. If kids are running amok, doing what they please without any class structure, there is a problem. The instructor should be strict yet fair. An instructor should never strike a child. Classes should be divided according to age and experience. Kids should not be in the same classes as adults. With children, the moves should be broken down into the most simple elements. If there are only a few kids in the class it’s not a good sign. A bigger class has a better vibe and is a sign the school is doing something right. Ask to observe a sparring session, where the more advanced students practice against each other. Is it strictly supervised by black belts? Is control enforced? Do the kids enjoy it? Is proper safety gear worn? Head gear, gloves, mouth guards, shin/foot protectors are a must for kids and adults alike. Look for schools that have been in business for at least a few years and have a good reputation in the community. The two usually go hand in hand. Is the location convenient for you? If you have to drive all the way across town to get there, you will probably drop out. There is no such thing as a “best style or system”. There is such a thing as a “best teacher”. It is essential that the instructor embodies the important things in the martial arts like respect and kindness. The chemistry between teacher and student is crucial. If your there is no rapport between the child and the instructor it will be an uphill battle. Are the kids truly enjoying themselves in the class? Recommendations from other parents are an excellent way to find good instructors. Lock-in contracts are not a good idea, unless you’ve had time to assess the quality of instruction. Find out what the total costs are. Grading fees, registration/membership fees, uniforms, mandatory equipment–it can all add up. If they are unable to give you a straight answer, find another school. How to Find the Best Martial Arts School for Your Kids is an original article from Sensei Matt Klein. For more information check our kids karate classes in Sydney. 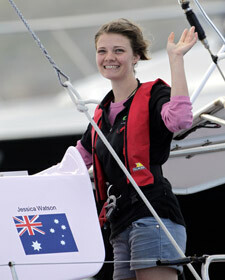 Jessica Watson completed her sail around the world today. Many people have circumnavigated the world solo in a sailboat—but Jessica Watson is a 16-year-old girl. This has never been done before. Whether you support her effort or not you have to admire her. We as martial artists can learn a lot from this story. Have a go. Jessica was not afraid to embark on this journey, despite her age. She was brave enough to give it a shot. I see this all the time in our students. This is why kids learn so fast. They are not afraid to look bad—they just do it. I have seen kids who have gone into their first karate tournament and won a trophy. It happens all the time. They were not afraid to have a go at it. Ignore the naysayers. There will always be “well wishers” who say “you shouldn’t do this or that” or “you are not ready”. Jessica ignored them and focused on the task at hand. Most successful people in the world have this important quality of ignoring those who doubt their abilities. Believe in yourself. When others doubt you and the task seems impossible, it is hard to keep going. But if you truly believe in yourself, as Jessica did, you will come through in the end. She believed firmly in her skill as a sailor, and that is what got her through a difficult journey. Don’t give up. Despite having a run-in with a huge freighter, a boat that overturned in 10-meter swells, freezing temperatures, broken equipment, and other hardships, Jessica did not even think of giving up. It is this quality that is most important for success. I have seen kids fail the black belt test two or three times, and then come back with a vengeance on the next grading, performing the best in their class. Never give up. Being in the “here and now” and enjoying the journey. From her blog “I’m having the time of my life slowly cruising up the coast, not pushing Ella’s Pink Lady too hard, and looking forward to arriving on the 15th. I’m enjoying all the highs of solo sailing and in just a few days, I’ve got seeing friends and family to look forward to”. She was clearly enjoying the journey, yet at the same time looking forward to happy times in the future. Work at your goals, but revel in your achievements and most importantly, enjoy the journey. Karate Kids and the Jessica Watson Story is an original article from Sensei Matt Klein. 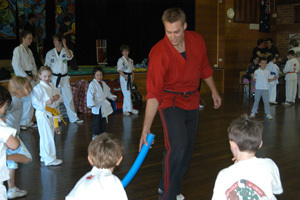 For more information check our kids karate classes in Sydney.